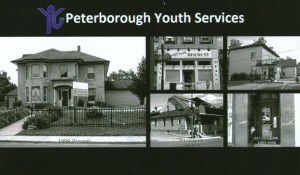 Peterborough Youth Services was established in 1976 under the name “Youth of Otonabee United.” A group of Peterborough people from the community, headed by Bill Samuels, a Sir Sandford Fleming College professor, identified a need for a community-based, non-residential, highly flexible program offering counselling, recreational, and educational activities where children could be referred by the courts and other sources. The original funding was from the Ministry of the Solicitor General, Canada, as a project in diverting youth in trouble with the law. Very early on; however, it became apparent that it was not only those in trouble or at risk of getting into trouble with the law who could benefit from the services of Youth of Otonabee. Referrals for young people struggling with a wide variety of social and emotional difficulties began coming to the program from many different agencies and professionals in the community as well as parents and young people themselves. In recognition of this expanded mandate, the Ontario Ministry of Community and Social Services designated the Agency as a child and family intervention/children’s mental health service and became the major funder in 1979. In 1986 the name was changed from Youth of Otonabee United to Peterborough Youth Services.